If Kareena Kapoor-Khan, Katrina Kaif and Priyanka Chopra are waging a battle for pay-package parity for heroines in a male-dominated industry, some women working behind-the-camera have also asserted that ‘not gender but talent’ matters. In an industry where only ‘heroes matter’, debutant director Gauri Shinde broke not only the myth but also boxoffice records with her heroine-centric English Vinglish starring a 50-ish Sridevi. The ad-filmmaker-turned director’s film about a woman seeking linguistic dignity was inspired by her own mother and the script dealt with an issue that was ‘right under our noses’ but only Gauri had the courage of the conviction. "Sridevi is as glamorous as she was 15 years ago, but for me, she was the actor I was working with. She brings in fluency to her performance," Gauri had, thus, lauded her muse. And how true her words were! Director Reema Kagti, who made her debut with Honeymoon Travels, seemed to have the daunting task of keeping the ‘interfering’ Aamir Khan at bay while directing Talaash. But Kagti had laughed off the ‘Aamir pressure’ saying, "There is pressure but the pressure is good. Aamir has the commitment, he works very hard. It is not like he is paying lip service. He is just trying to make a very good film. If there is any pressure on me, it’s coming from that space. As a director, I felt very empowered ever since he has come on this project. He brings a lot to the table and most of it is very good advice." The thriller with Aamir-edge went down well with a niche audience. The invincible Khan triumvirate has graciously bowed before the women power. Salman Khan shed his enfant terrible tag when brand manager Reshma Shetty stepped in to give his image a total makeover. She is also credited with hiking his fees to a whopping ~50 crore. Sanjay Dutt and Madhuri Dixit left their long-trusted secretaries and entrusted their work to Shetty. "What she has brought to the career graphs of some of our biggest stars is amazing. Hence, I wanted my actors to be managed and protected by the best in the business," reasoned Karan Johar, when he handed over the accounts of his Student of the Year stars to Shetty. On the other hand, Shah Rukh Khan’s business manager Karuna Badwal has been managing his account for years now. Also SRK had no qualms in starring in a film being directed by a lady as he launched Farah Khan with Main Hoon Na. Likewise, Aamir Khan enjoyed being directed by his wife in Dhobi Ghat, he also gave directorial break to Anusha Rizvi in Peepli Live and he swears by his perfectionist secretary, Binky Mendez. Recent years have been special in terms of women-centric films that won plaudits. Producer Ekta Kapoor’s The Dirty Picture hit a high with her unusual and controversial film delving into the sexuality of a woman, "I had to tell the story of a woman who was willing to dress the way she wants, dance the way she wants, get success on her terms, have the number of men she wants in her life — and yet, be accepted. She’s neither a victim nor a martyr, nor a crusader. She’s a survivor! And she was my hero!" asserted Kapoor in an interview. Kapoor hasn’t taken the beaten path — if her upcoming films — Once Upon A Time in Mumbai, Shootout At Wadala and Ek Thi Daayan — are any indication, she certainly has charted her own road map to success. The year gone by also had Yash Raj Films launching their first woman director, Nupur Asthana with Y-Film’s second venture Mujhse Fraaandship Karoge. She has been pencilled in to direct YRF’s Ayushmann Khurrana-Sonam starrer next. This veteran TV serial director sure got her big break. When veteran film writer Salim Khan gave his Filmfare trophy to Juhi Chaturvedi, the debutant script writer of the much-acclaimed film Vicky Donor, she knew she had made her mark with her penwomanship. "We took a different path and tried to make it charming and light-hearted while also trying to remove the stigma attached to it. That’s why Dr Chaddha (Annu Kapoor playing the infertility specialist) uses phrases like ‘angry sperm’, ‘greedy sperm’, etc. to describe his star donor’s various moods," she had revealed her success mantra in an earlier interview. Chaturvedi has been pencilled in for Shekhar Kapur’s next. Women screenwriters Urmi Juvekar (Oye Lucky! Lucky Oye!, Shanghai), Ila Bedi Datta (Agneepath), Bhavani Iyer (Black and Guzaarish) have emerged successful now. They are the successors of the legacy of Sooni Taporewala (Salaam Bombay), Honey Irani (Darr, Krrish, Aaina) and Kamna Chandra (Chandni, Kareeb). 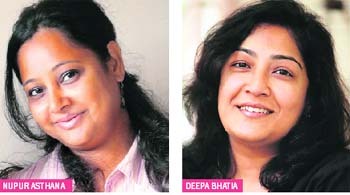 Following in the footsteps of late Renu Saluja, a graduate from the Film and Television Institute of India, two women editors — Aarti Bajaj (Ishaqzaade, Paan Singh Tomar) and Deepa Bhatia (Kai Po Che, Student of the Year, Ferrari Ki Sawaari) have been sharpening their scissor hands. "Bollywood is one place where more than the gender, it is one’s talent that counts. I never felt any resistance when I turned independent choreographer with Nagina in 1986, even though the profession was then dominated by men," Saroj had said in one of her interviews. The gender bias, which appeared to be stronger in the field of music composing, has been smashed by young Sneha Khanwalkar with her catchy folksy numbers in Anurag Kashyap’s Gangs of Wasseypur Part 1 and 2. The only department that hasn’t yet witnessed the girl power is the action direction. But in days to come, don’t be surprised if a high-voltage stunt act is being pulled off by some courageous hunterwali! There is pressure but it is positive. Aamir has the commitment, he works very hard. It is not like he is paying lip service. He is just trying to make a very good film. Sridevi is as glamorous as she was 15 years ago, but for me, she was the actor I was working with. She brings in fluency to her performance. The gender bias, which appeared to be quite strong in the field of music composing, has been smashed by young Sneha Khanwalkar with her catchy folksy numbers in Anurag Kashyap’s Gangs of Wasseypur Part 1 and 2. Sneha Khanwalkar “What she has brought to the career graphs of some of our biggest stars is amazing. Hence, I wanted my actors to be managed and protected by the best in the business,” reasoned Karan Johar, when he handed over the accounts of his Student of the Year stars to Shetty. Bimal Roy’s most outstanding film Bandini, celebrates its 50th year. It won the National Award for the Best Feature Film (Hindi) in 1964. It won almost all major Filmfare Awards — Best Film, Best director, Best Actress (Nutan), Best Cinematographer (Kamal Bose), Best Sound Design (D. Billimoria) and Best Story (Jarasandha). It was a big commercial success. The film starred the smashingly handsome Dharmendra as the jail doctor while Ashok Kumar portrayed a political extremist. Gulzar entered into the world of lyrics in this film almost by accident. "Before all the songs were complete, the original lyricist, Shailendra and the music director Burman-Dada had a tiff. Shailendra walked out of the film. I wrote the lyrics "Mora goraa ange lai le". After the song was recorded, Burman-dada and Shailendra-ji had patched up and I was out," recalls Gulzar. Bandini (1963) based on Tamasi, a Bengali novel by Jarasandha (Charu Chandra Chakrabarty) is seen as the culmination of Bimal Roy’s command over the language of cinema. Every frame is carefully designed, well orchestrated and spilling over with layers of meaning. Jarasandha’s career began as a jailor in the northern parts of Bengal and culminated when he retired as jail superintendent. He began writing on his experiences as jailor, creating a new genre in Bengali literature where most of the characters were either behind bars or were officiating jailors and prison staff. Bandini is the story of Kalyani, a woman prisoner charged with murder. 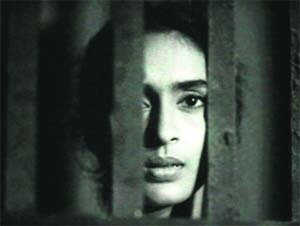 It is perhaps the first Hindi film to depict the story of a woman prisoner imprisoned for life for murder. She confessed and made no plea for forgiveness nor did she harbour any sense of guilt. The story moves back and forth in time. Narrated from Kalyani’s point of view, it is set around 1934. In the flashback, it goes further back into time to trace what led Kalyani to commit murder. Does she agree to marry the handsome jail doctor? Or does she go back to the dying man she felt had betrayed her in love? Nutan communicates mainly with her eyes. She has little dialogue. She fleshes out Kalyani as a quiet but determined woman with a dignity that belies her prison backdrop and her murderer status. Her mental state is expressed through a flood of fleeting facial emotions, especially in the scenes leading up to the murder and afterwards. When the body is discovered the next morning, she pulls at her hair, her saree falling off her chest, screaming out that she is the one who has killed the woman. The title Bandini stands out in stark irony of a woman, who spent a slice of her life behind bars but lived life on her own terms. The call of the prison guard announcing "Sab Theek Hai" (everything is fine) spells out the opposite — nothing is fine. It is a pointer to the irony behind the walls of a prison where prisoners, stripped of their human identity, are mere numbers; where life is reduced to an eternity of waiting either to go out to an unkind world that will not accept them, or to die behind bars — unsung, unwept and unknown.